Ilan Ramon: Israel’s First Astronaut balances the sad reality of the loss of the Columbia crew with the personal story of this upbeat man. The many family photos of Ramon, coupled with an engaging text, make this biography a pleasure to read. The book opens with a recap of the Columbia mission and the breakup of the Columbia just before touch down, but the focus of the book is on the way Ilan Ramon lived his life. An experienced fighter pilot, Ramon jumped at the chance to be Israel’s first astronaut. He was proud to be representing his country and Jews around the world. Author Tanya Lee Stone does an excellent job of conveying the excitement felt in Israel and the Ramon household. She also describes the three very special items he chose to bring into space with him, sharing the significance these items held for Ramon and the Jewish community. Each chapter details an aspect of Ramon’s path to becoming an astronaut and his journey into space. A particularly interesting chapter describes the experiments done on the Columbia mission. The book also has three two-page informational inserts. “What is a Space Shuttle?,” “Astronaut Jobs,” and “Food in Space” combine interesting information with a number of color photos that bring the words to life for a young reader. Wonderful quotes from Ramon’s family and co-workers give the reader a sense of the warmth and enthusiasm Ramon had for space and the people around him. Ilan Ramon: Israel’s First Astronaut leaves readers with the feeling they’ve met Ilan Ramon. The chronology of his life, bibliography of printed material and internet sources, and an excellent index provide resources for additional study. The photos throughout the book take us into the excitement surrounding the mission as well as the sadness around Ramon’s untimely death. 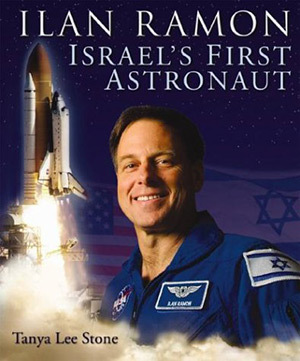 My kids enjoyed reading Ilan Ramon: Israel’s First Astronaut and looking at the photos of his family and the Columbia mission.